As most of you know, I moved from North Carolina to Michigan this summer. Fearing I wouldn't have quite the same access to great BBQ products in the Wolverine state as I did in the Carolinas, I spent our last week in North Carolina scouring supermarkets for local sauces. On my final trip to Harris Teeter (High Point, NC), I picked up a jar of Old Mule Original BBQ-Marinade-Dipping Sauce. Old Mule Inc. is a small, family run operation that cooks their sauces on a farm in the Blue Ridge Mountains. The sauce originated as a homemade treat given as Christmas presents to friends and family. As with many small businesses, it took several years and a lot of support (and prodding) from family to turn Old Mule into an actual business venture. Old Mule Original is packaged for retail sale in either 18 oz glass mason jars or half gallon glass jugs. The vintage brown label is simple, but stylish. According the Old Mule website, they were shooting for a look "reminiscent of the old time general store." 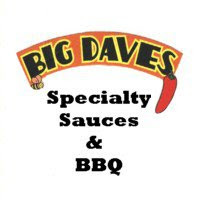 The original sauce is a beautiful mahogany color, speckled with black pepper and various spices. It's fairly thick, but still pours quickly thanks to the large opening on the mason jar. 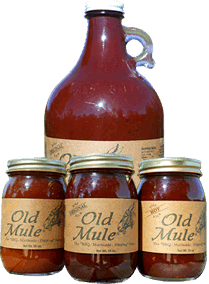 Despite it's deep Carolina roots, Old Mule Original is a tomato based sauce. It is, however, accented heavily with vinegar. More like something out of the Midwest, Old Mule is fairly sweet thanks to brown sugar and corn syrup. The vinegar, along with a bit of pepper spice are clearly noticable in the finish. The overall tone of the sauce is very well balanced. It's a Kansas City sauce with an extra bit of vinegar tang. I was anxious to sample Old Mule because it just looked so great in the jar. The color and thickness screamed RIBS so I picked up a few slabs of baby backs (got an incredible buy). I used Old Mule as a finishing sauce for the slow smoked ribs and was thrilled with the results. The rich color and smooth texture made the ribs a work of art. I felt like Picasso as I carefully glazed each rack. As I'd expected, the flavor of the sauce was a perfect compliment to the smokey pork. It especially paired nicely with the sweet and savory BBQ rub (Jake's) I'd used. Like so many other sauces, Old Mule seemed to get better when heated. It thinned slightly, but still maintained a rich, bold flavor with just a hint of tangy spice. It went over well with the Michiganders that I fed. The previous paragraphs would seem to suggest that I enjoyed my first taste of Old Mule. However, just to make my feelings about the sauce clear, it should be noted that Old Mule Original BBQ-Marinade-Dipping Sauce was my choice to use in my first competition cook. I did test cooks with a few excellent sauces, but ultimately settled on Old Mule for it's bold flavor and beautiful color. It should also be noted, however, that I never actually competed. With the impending due date of our daughter just a few days after the event, I was reluctant to pay the entry fee with the possibility of being unable to compete looming. Fortunately for me, no competition meant that I got to enjoy more of the sauce for myself. Old Mule was just as tasty on back yard BBQ as it would have been in competition. Who knows, if I'm fortunate enough to score another jar, maybe I'll use it for next year's competition. Re-stocking on sauce may be a good excuse for a return trip to North Carolina. For more info on Old Mule sauces, check out www.oldmule.com. Don't forget to see how Old Mule Original BBQ-Marinade-Dipping Sauce rates on The "Q" Review's "Product Reviews" page. 4 Response to "Old Mule Original BBQ-Marinade-Dipping Sauce"
Sounds good Derek! How do you compare it to Curt's? I ran out of my Curt's and have had to use some national crap (guy fieri bourbon and brown sugar)but can not take it anymore. Curt's is sweeter and much brighter in color. Old Mule has a bit more tang. They are about the same thickness. If you forced me to choose one over the other, I'd probably go with Curt's, but they're both excellent sauces. I will give it a shot. I compare everything to Curt's Hot..Keep up the great reviews. Thank you for sharing the post! I'm glad to find this new here.